Rain Man is a 1988 American comedy-drama road movie directed by Barry Levinson and written by Barry Morrow and Ronald Bass. 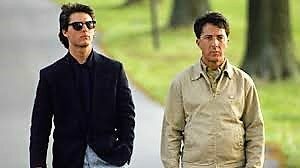 It tells the story of an abrasive, selfish young wheeler-dealer Charlie Babbitt (Tom Cruise), who discovers that his estranged father has died and bequeathed all of his multi million-dollar estate to his other son, Raymond (Dustin Hoffman), an autistic savant, of whose existence Charlie was unaware. Charlie is left with only his father’s car and collection of rose bushes. In addition to the two leads, Valeria Golino stars as Charlie’s girlfriend, Susanna.